A microscopic image of gallium nitride bears remarkable resemblance to the famous ‘Water Lilies’ series by impressionist Claude Monet. Orion’s Nebula is the brightest nebulae in the night sky. 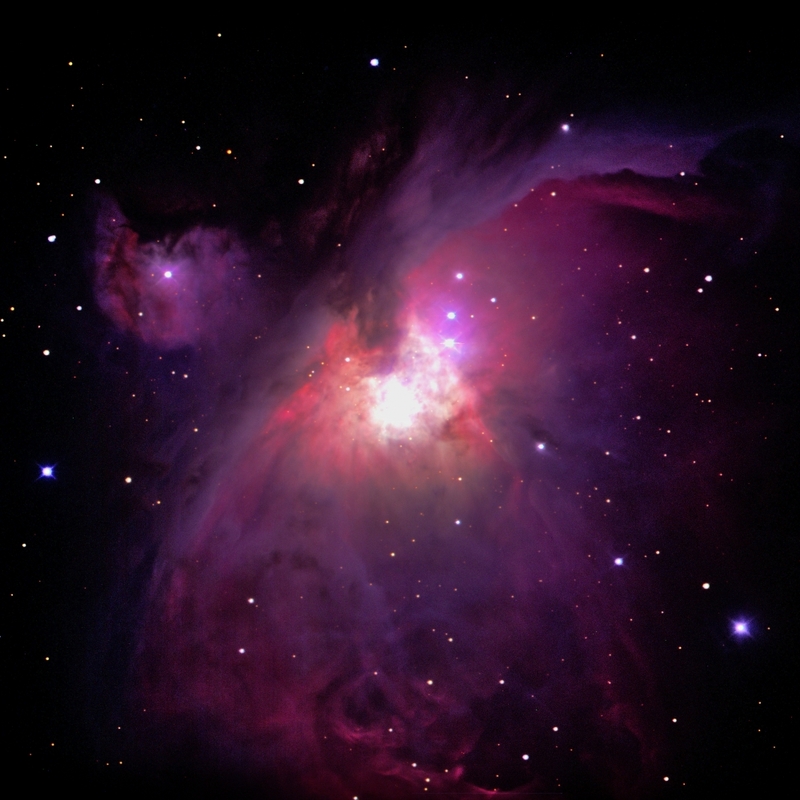 This picture was taken using the Las Cumbres Observatory, using three separate filters to capture specific wavelengths of the nebula. 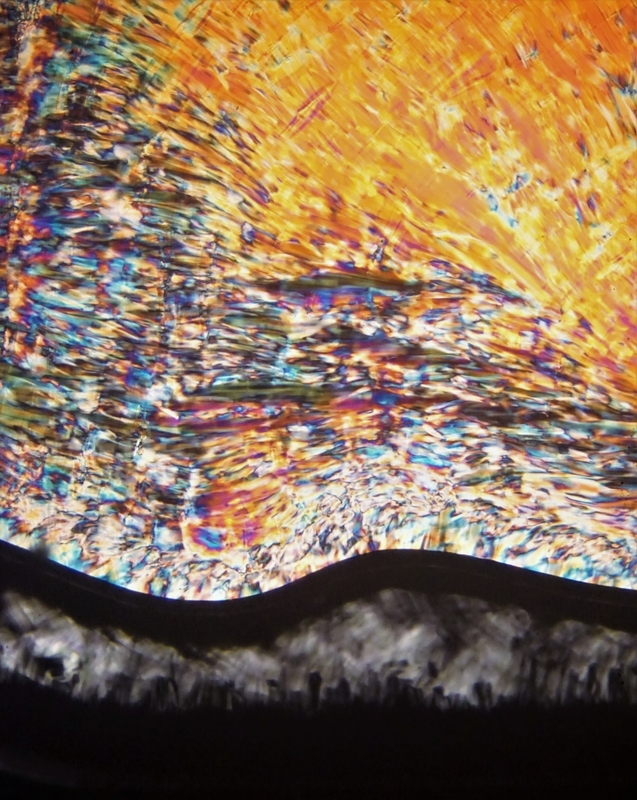 Hydrocarbon chains organized in stacked 2D layers interspersed with layers of water, called lamella. They refract light differently depending on the angle of incidence. The rotated light escapes crossed-polarizers and appears as streaks of color over a dark background. 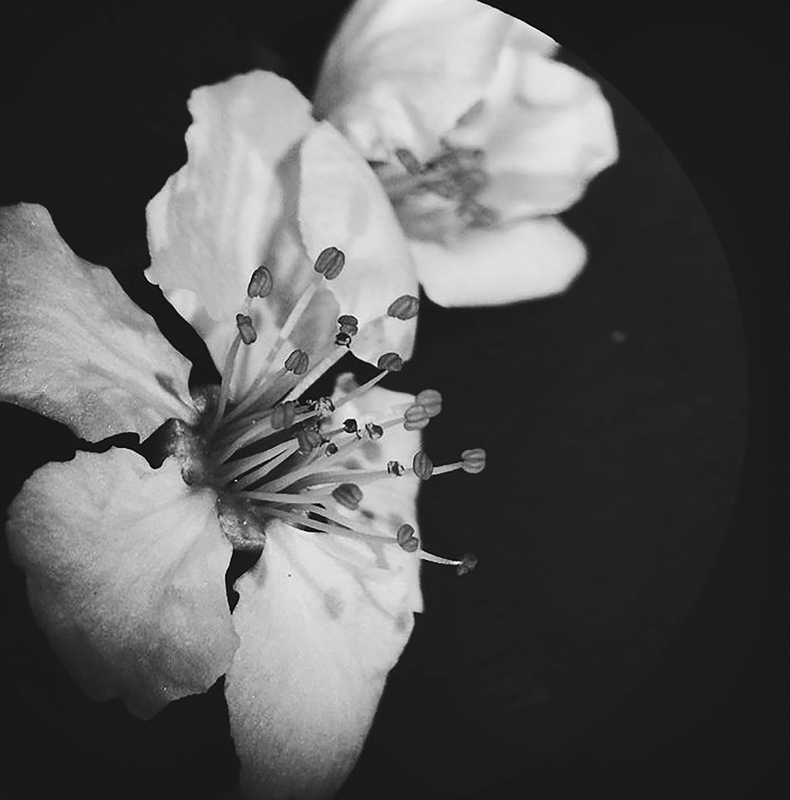 A fully-bloomed cherry blossom captured under a dissecting microscope. Microtubules transport materials inside a cell with the help of molecular motors and ATP, a compund that provides the energy for many biological processes. Ascidians are marine animals related to vertebrates like us. B. schlosseri is a colonial ascidian that has its blood vessels outside of its body. 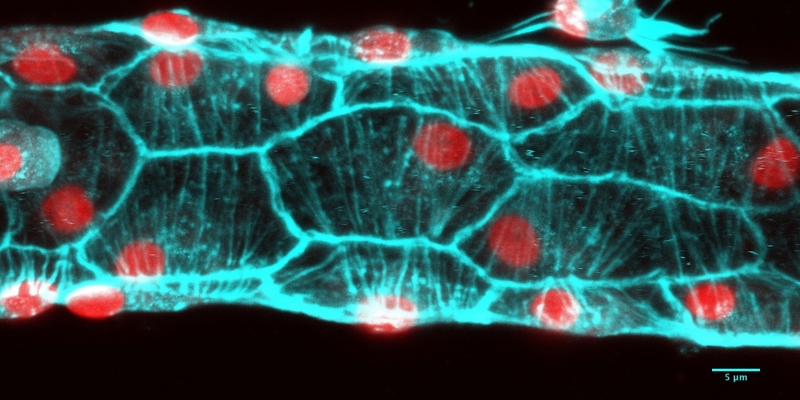 Different dyes reveal the protein Actin (in blue) and the cell nuclei (red). Pi Day was particularly sweet for Nancy Scherich and her team, whose video, “Math Dance 2,” took first place honors in the campus’s Art of Science competition. Pi Day — March 14 — invites scientists and nonscientists alike to consider the aesthetics of subjects often considered dry or detached. Serendipitously, the announcement of the 2019 winners fell on this whimsical day. Art of Science explores the creative and experimental nature of science. The annual competition challenges scientists, engineers, and mathematicians across campus to explore the artistic side of their work. Researchers submit photos, graphics and videos that reveal the beauty hidden within the data and equations. This year’s submissions ranged from pebble crabs hiding among coral to anthropomorphic lab equipment. “This competition invites scientists from all levels and all disciplines, undergrads to postdocs, to come together and celebrate beauty and discovery,” said co-organizer Wendy Ibsen, an associate director of the Center for Science and Engineering Partnerships (CSEP) at the California Nanosystems Institute. Art and science have more in common than what’s apparent at first glance. “They share many of the same principals of curiosity and creativity in challenging ourselves and others to discover and appreciate more of the world around us,” explained Ibsen’s co-organizer Arica Lubin, also an associate director at CSEP. The competition began in 2014 when Assistant Professor Jon Schuller introduced the idea as part of a grant. “I thought this contest would be a great way to get the public to engage with science,” said Schuller, who has continued to help coordinate the event. “Anyone can appreciate a beautiful image that speaks to them; hopefully in doing so they think a bit about how and why it was made.” A number of groups have joined Schuller as sponsors since the event began, including CSEP, the UC Santa Barbara Library and the College of Creative Studies. Crystals were a popular theme this year. 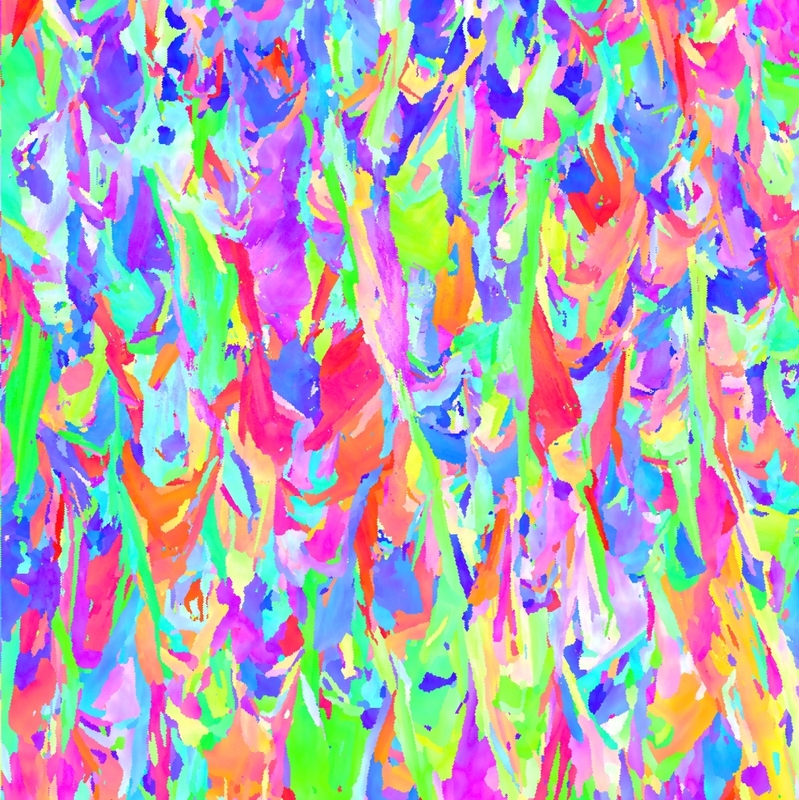 Materials grad student Jeff Rossin took third place with his rainbow image of a 3D-printed nickel alloy. 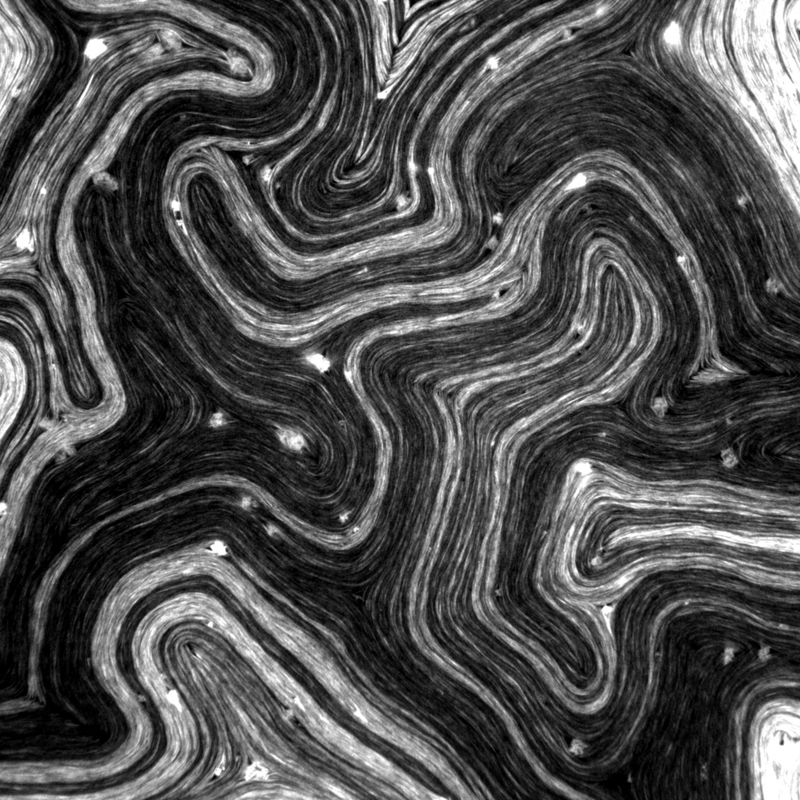 Through an electron microscope, the metal grains take on the aesthetic of an abstract expressionist painting. Mayela Aldaz-Cervantes, another material science grad student, won second place. 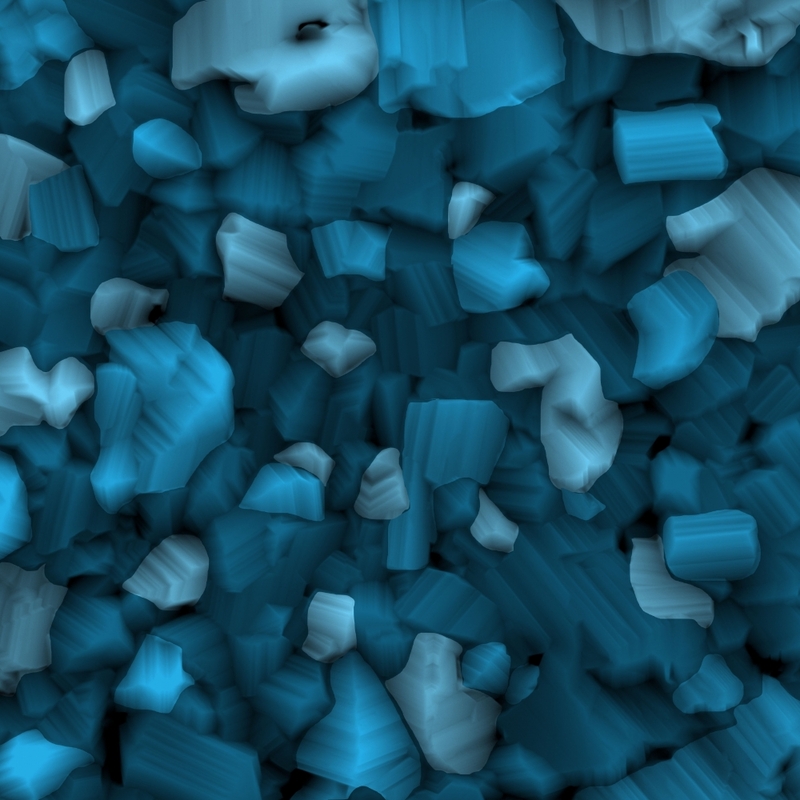 Her entry “Everyday I Have the Oxide Blues” also featured metal crystals imaged through an electron microscope. 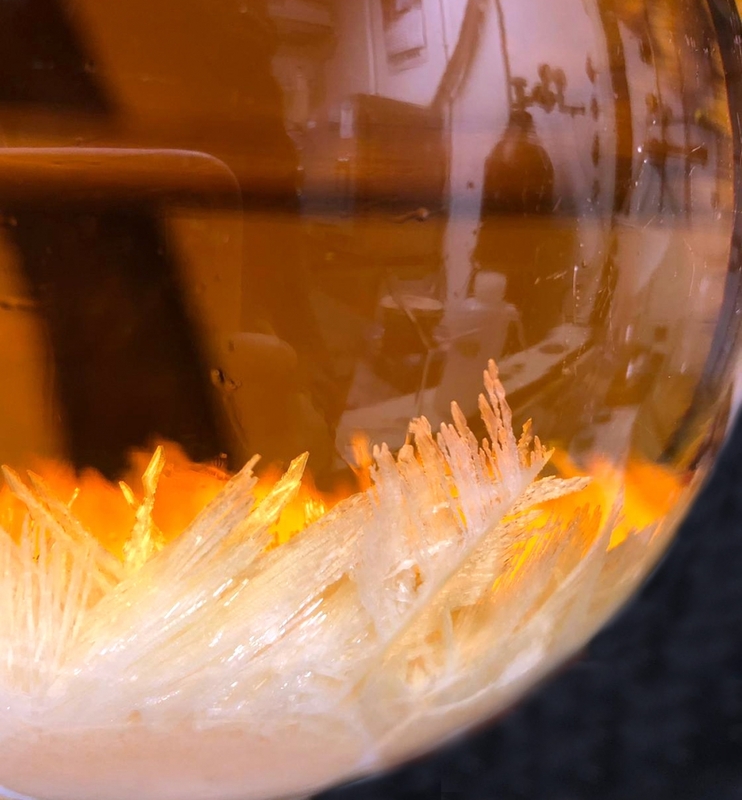 “One can say that organic chemistry is not super ‘artistic,’” wrote Podunavac, “so whenever it happens to have a bright colored solution or crystals — it is time for a picture!” Crystals of pure trimethylsulfonium iodide frost the bottom of a test-tube contrasting with the orange solution from which they precipitated. Despite the popularity and elegance of these crystalline creations, first place went to mathematics graduate student Nancy Scherich, who used modern dance to interpret three different disciplines in mathematics. The number is set to music created specifically for the routine by the husband of one of Scherich’s mathematician friends. Scherich has been a dancer all her life, studying everything form ballet and jazz as a child to ballroom and modern dance more recently. In 2017 she won Science magazine’s “Dance Your Ph.D.” competition with a dance video describing her dissertation. Since then, she’s done many live performances and math-dance educational outreach activities. According to Scherich, people are less familiar with mathematics than with science, and she believes two main factors are to blame: math anxiety and lack of outreach by mathematicians. “Many people are plagued by math anxiety, and they find it very difficult to talk about math because they have to face their internal fear of the subject,” she said. “On the other hand, there’s a common misconception among math experts that ‘it is impossible to explain my work to non-math people, so why bother?’” she added. Scherich’s piece even featured a subtle nod to pi. The clapperboard at the end of the video says “take 3.14,” the number’s first three digits. The UC Santa Barbara Library will display the collection beginning in late June. Past submissions are on exhibit in Elings Hall.